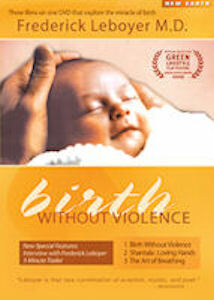 Birth Without Violence is comprised of three unique films on one DVD. The first film, ‘Birth Without Violence’, takes a revolutionary look at the way we welcome our children into the world. ‘Shantala: Loving Hands’, the second film on the DVD, examines traditional East Indian massage derived from Ayurveda, emphasizing the importance of touch for the newborn. Finally, in the third film, ‘The Art of Breathing’, Savitry Nayar Shivalingapa teaches the traditional carnatic chanting connected to Qi Gong and Yoga Prana, accompanied by the tampoura.